When it comes to renovating your shower, few options are more popular than natural stone. For one, it can last a lifetime and for two, it instantly transforms any bathroom into an elegant yet completely unique space (not to mention it’s incredibly easy to clean! ), and of course it immediately adds value to your home. Caring for natural stone in your shower is simple once you know the basic maintenance steps to take. 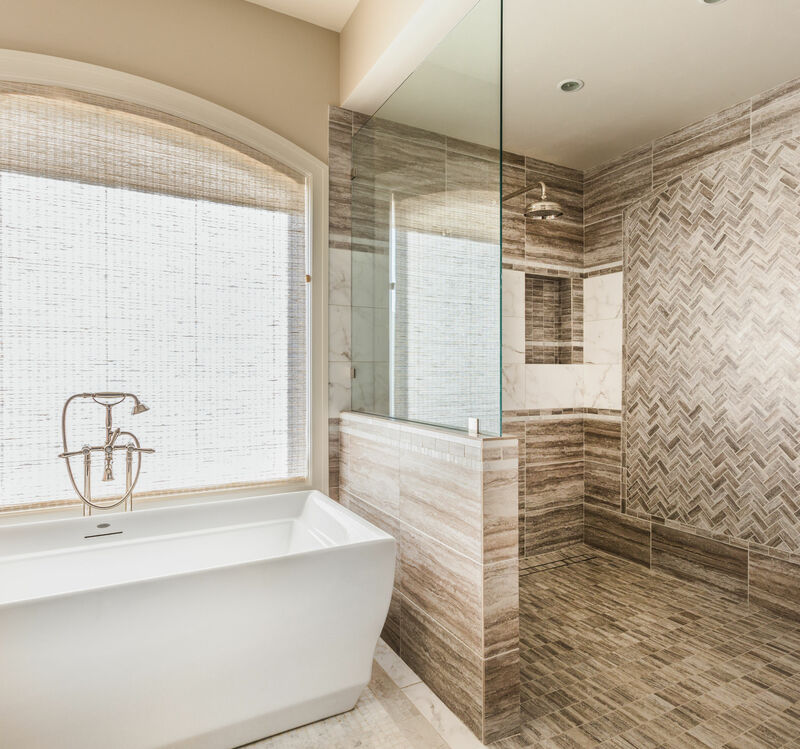 Keep reading to learn how to keep your beautiful natural stone shower in prime condition. Everything you will need can be sourced in the MARBLELIFE® Stone Shower Kit – Clean & Seal to address daily grime, water spots, calcium deposits, soap scum build-up or mold and mildew. Most of us rarely stop to consider the many forces working against your efforts to maintain a clean pleasant shower space. MARBLELIFE’s kit represents an evolution in learnings based on decades of in the field experience. With these in hand here’s what happens next. When cleaning your shower, use a stone-safe cleaning product like MARBLELIFE® Marble & Travertine Cleaner to remove oils and daily grime deposits. Make sure the product you’re using is designed for natural stone and more importantly is non-acidic. Never use common bathroom or household cleaning products on natural stone as these products may use acidic ingredients that are safe for use on more common bathroom tile surfaces such as ceramic and porcelain but will dissolve marble creating white etch marks which require a professional to rehone and polish the surface to remove. (We know we get these calls after every CLR commercial.) You do not want that $15 dollar bottle of cleaner creating a $1000 repair bill. Use a non-acidic stone safe cleaner such as MARBLELIFE Marble & Travertine Cleaner. If water spots, mildew, and dulling of the stone are your primary concerns, take care to remove excess water on the walls with a squeegee after you shower. Regardless of your shower tile type, when water evaporates it will leave behind any calcium that was dissolved in it creating a hard water stain or spot. This is an annoyance whenever it occurs as it will generally take more than a common cleaner to remove. These are avoidable with a quick post-shower squeegee of the glass door and walls. Once allowed to form they generally require an acid to remove, which means that lemon juice can work for your ceramic or porcelain tile, but cannot be done with your acid sensitive marble without creating an etch as the same acid that dissolves calcium deposits dissolves the calcium making up your marble. These acidics will also damage the seal on your grout regardless of the type of tile. The other option is to install a water softener, but a squeegee is the less expensive solution. Remove the excess water and you also slow the appearance of mold and mildew which require a moist environment. The simply step of removing the water droplets with a squeegee is often enough to hold these nasties at bay. Using a squeegee allows the stone to dry faster. If you notice mold or mildew stains on your stone tile, don’t panic. You can easily and safely remove it by using our MARBLELIFE® Mold & Mildew Stain Remover for Tile Showers. Spray onto the tile and rub with a non-abrasive pad or bristled brush. Let the solution sit for about 15 minutes after scrubbing, then rinse away with water. Often described as magic. 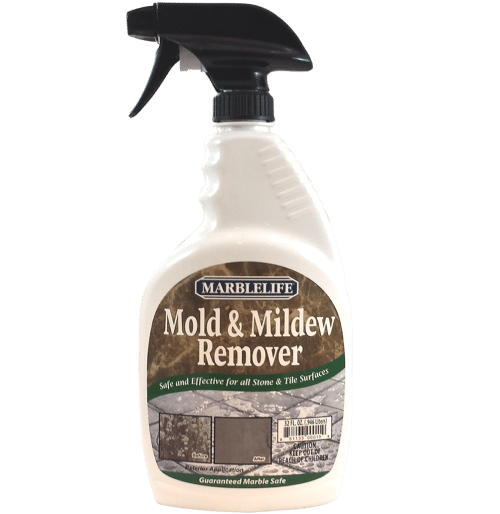 MARBLELIFE Mold and Mildew Cleaner provides an instant improvement. It can be easy to focus your cleaning efforts solely on your stone, but the grout between the tiles also need some TLC every now and again. No one wants to clean grout with a toothbrush once it has stained, so as always its best to stay ahead of the game. Use a non-abrasive non-acidic stone-safe grout cleaner like MARBLELIFE® MaxOut Tile & Grout Deep Cleaner to agitate and lift grime and debris. If you have black grout, you will literally see the cleaner lifting out the dirt as it changes color as it works. Rinse with water after cleaning and dry the grout with a clean, dry towel. Often we are cleaning OUT the grout as much as cleaning OFF the grout. If an acidic cleaner has been used in the past we may have damaged the seal on the grout, allowing the naturally occurring pores to be opened once again to trap dirt and providing the stained appearance we hate to see. As such, sealing is as much about maintaining a clean appearance as cleaning is. We recommend sealing grout regularly to maintain optimum protection. It’s always important to seal natural stone and grout to create a barrier that keeps dirt and grime on top where it is easier to remove. Once it penetrates into the pores of the stone and grout a gentle wipe is no longer enough to get them clean. Sealing today will maintain an easier to clean surface in the future. When you have stone in the shower, sealing is even more important because the stone is constantly being exposed to water, shampoo, soap, and beauty care products. Sealing also keeps bacteria out of the stone and keeps the shower sanitary. Apply MARBLELIFE® Stone Sealer to the surface using a dry micro fiber towel and allow to set for 2 to 5 minutes then immediately buff into the stone with a clean cloth. You want to remove the excess from the surface, as our goal is to get the sealer into the pores only. We want the pores filled, and the surface wiped free of sealer. Buff until the sealer is absorbed and dry to prevent haziness on the stone caused by leaving excess sealer on the surface. This is a very easy application. This is why you want to use a penetrating sealer versus a topical sealer which is designed to alter or cover the surface appearance. 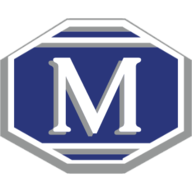 Whether caring for travertine, granite, marble, or any other type of natural stone, MARBLELIFE®, carries industry-leading products developed based on decades of field experience, and employed daily by the largest team of stone professionals in North America. We use them because they work better than anything else, and allow us to get on and off our projects as quickly as possible. If something was better – we would be using it. For more information about natural stone care, contact your local MARBLELIFE® office and a knowledgeable stone craftsman will be happy to assist you. Mold and Mildew Stain Remover is completely safe for ceramic, porcelain and all types of tile showers with sanded and non sanded grout, as well as glass, metal and plastic enclosures and fixtures.